Irregular heartbeat, also known as arrhythmia, can be scary and unsettling, whether you feel your heart skipping a beat, racing, or hammering. However, they are common throughout periods of hormonal imbalance, such as during menopause. Even though curing them isn't possibly unless you treat the underlying cause, there are things that you can do to help them subside right now. 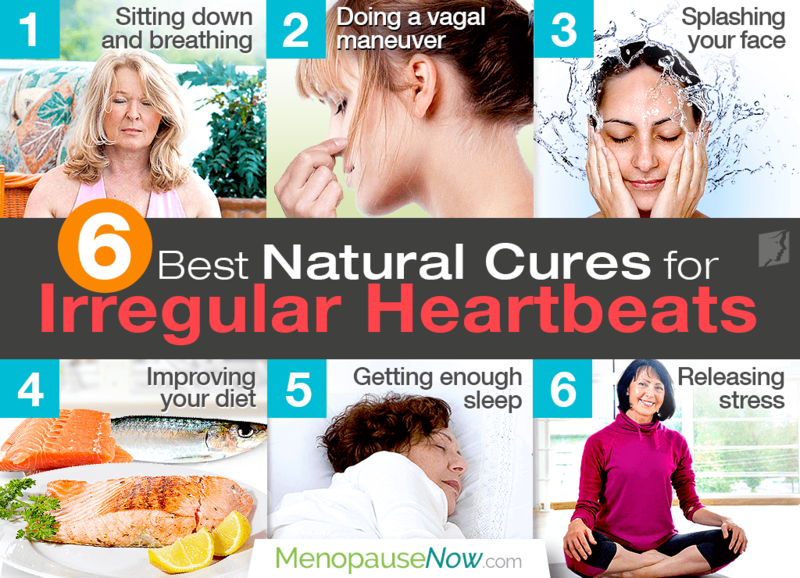 Continue reading to discover the six best natural ways to cure irregular heartbeat episodes instantly to be on your way to optimal cardiovascular health. If you begin feeling your heart beating irregularly, one of the best natural arrhythmia cures is to sit down with your feet elevated from the ground and inhale deeply and slowly. Focus on taking long, steady breaths, and you should see your heartbeat return to a normal pace within a few moments. Making sure that you stay properly hydrated is vital to the overall health of your body. In addition, drinking cold water when suffering from an irregular heartbeat can cause an instant rectification, though researchers are still investigating exact implications. Splashing your face with ice-cold water can cause a mild shock to your body, which, in some cases, is enough to relieve your irregular heartbeat. If this is not enough by itself, follow it with a few minutes of deep breathing in the privacy of the restroom. Omega-3 fatty acids - as found in oily fish such as mackerel and salmon - are important elements in maintaining heart health. Also, take care not to overeat since eating too much in one sitting may result in blood rushing to the digestive tract, causing an irregular heartbeat. Adults require around eight hours of sleep each night to function at their optimum ability, but most people rarely get enough. Lack of sleep can leave you at heightened risk of experiencing a racing or missed heartbeat. Stress is a common underlying factor for arrhythmias, and it is natural that women may experience higher stress levels during menopause. Take time out of each day to spend by yourself doing something you enjoy, and try stress-relief techniques of meditation, visualization exercises, yoga, tai chi, etc. Whenever you feel your heartbeat racing, fluttering, or missing a beat, remember to follow the aforementioned ways to cure arrhythmia naturally. You can also look to relieve this symptom at its source with proper irregular heartbeat treatments. Click on the preceding link to find out how. The signs of an irregular heartbeat are something that many women experience at some stage throughout their lives. Learn how to identify them here.